Max's fluffy coat is breathtaking in more ways than one. If dander's your enemy, an annoying home allergy can progress into full-blown asthma. If you suffer from bouts of coughing or a whistling wheeze, your snuggle buddy could be to blame. Sleeping next to Max may calm your soul, but for some it wreaks havoc on the lungs. Asthma is a chronic disease that affects the airways carrying air to the lungs. Sufferers' airways are chronically swollen and inflamed, making breathing difficult. It can cause periods of wheezing and coughing at bedtime or when you wake up. When exposed to an irritant such as pet dander, cold air or strong cleaning chemicals, the airways can swell even further. This event is an asthma attack. In severe cases, an asthma attack could be fatal if left untreated. In allergic asthma, a sufferer has a response to a specific allergen, like pet dander, that causes the airways to swell. According to the Asthma and Allergy Foundation of America, 50 percent of asthma sufferers have allergic asthma. This type of asthma is treated with intermittent inhaler use. Usually, if sufferers avoid the asthma trigger, they avoid asthma attacks. Using an inhaler or breathing treatment can reverse most of the swelling of an acute asthma attack. Unfortunately, no cure exists for asthma. While cats don't actually cause you have asthma, they carry matter that can trigger the allergic response that can eventually lead to asthma if you are already sensitive to the allergen. Allergens are present in Max's poop, pee, saliva, fur, and dead skin cells or dander. 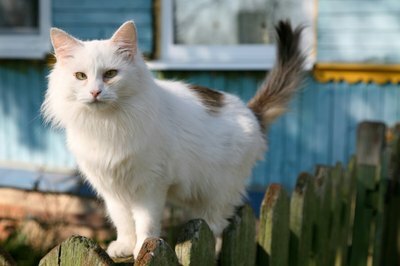 Even if you don't own a cat, allergens can be tracked in from outside. Animal allergens are often found even in homes that don't have fur babies. A study by Professor Thomas Platts-Mills of the University of Virginia Asthma and Allergic Disease Center found that some children develop an antibody that stops them from having an allergic reaction to cats. It seems to be just as common for a child to develop the anitbody as it is for him to develop an allergy. You don't necessarily have to give up your cat if you have a child with allergies. It's possible the child could develop this immunity to cat allergies due to exposure to the cat and not develop asthma at all. The study showed that kids who don't have a cat while many of their friends and family do are more likely to be allergic. However, if you or your child does develop cat-triggered asthma, it's best to find your fur baby a new forever home. Can Clean Cat Litter Trigger Asthma Attacks in People? Are Hairless Cats Good for Asthmatics?